Curated by a team of six young Irish architects and designers, Free Market aims to reassert the declining rural market square as a public place of social, political and cultural exchange, central to community cohesion. In doing so, it will highlight the generosity, humanity and possibilities that are embodied in the market place. One in three Irish people live in a town, and this exhibition focusses on small towns of less than 5,000 people. Once the economic and social hubs of rural Ireland, many market squares in these towns have seen their function as a place for exchange and congregation diminished. Many others have surrendered their role as markets and are now used only for car parking. Free Market aims to explore the unique identity of these market towns while reflecting regional variation and historic development. In response to the Freespace theme chosen by the curators of the Biennale Architettura 2018, Yvonne Farrell and Shelley McNamara, Free Market will act as a real market square, offering an engaging place to meet, to pause, to interact with the exhibits and openly exchange ideas. 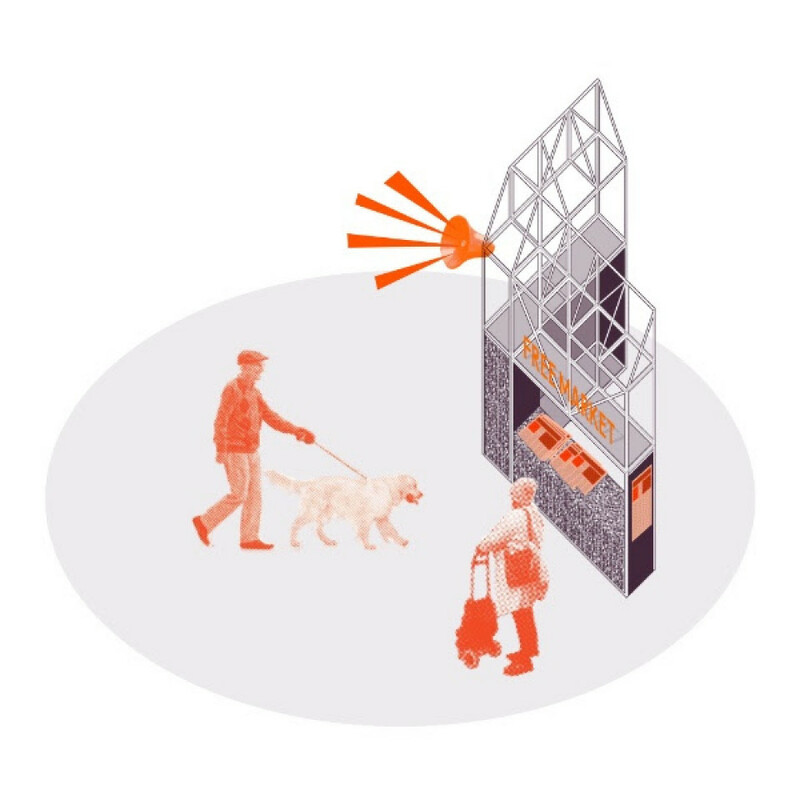 Evoking the character of the market space through the use of texture, proportion, colour and sound, the pavilion will also include architectural models and drawings describing both the historic and contemporary conditions of these towns. The curators of Ireland Pavilion also responded to the Freespace theme by providing a space for ‘deep curiosity, imagination and creativity’ through the work of fiction writers, artists, poets and playwrights, exploring the character and nuance of the language and life of small towns. Their work is presented alongside that of theorists, critics, policy makers, architects and planners. There will also be proposals for how design and planning professionals best engage with the potential and future of these towns. These exhibits will be accompanied by soundscapes from rural Ireland broadcast by the pavilion’s own Free Market Radio. A newspaper entitled Free Market News, distributed at the pavilion, collects writings on rural towns from nearly 40 expert contributors, while 3 audio pieces ‘Sound Travels’ give perspectives on the lived experiences of small towns. “Many of the challenges facing towns in Ireland are common to rural towns throughout the world. We hope that by presenting Irish towns on the global stage in Venice, we can open a much needed conversation about the resilience of rural towns in an international context,” says co-curator Miriam Delaney. The Free Market curators conceived the exhibition at the 16th International Architecture Exhibition as the first phase of the project. After the Biennale Architettura 2018, Free Market will return to Ireland to tour small towns around the country in 2019, gathering stories and participants and continuing to evolve along the way. What kind of contributions will Yvonne Farrell and Shelley McNamara make to the architecture scene with this open-ended Freespace theme? This is something that we will see in time. There is no stronger contrasting image to the notion of free space than the one of borders, dividing territories and restricting access through definitions of nationality and citizenship. If I have to summarize the biennale in one word, it would be “foggy”. And the main reason of the fogginess is the theme itself. What is an Architecture Biennale? The pressure of the prestige makes the Venice Biennale highly hierarchical, hence, every recent general curator has been someone already well reputed in the architecture community.